For the last few days I’ve been trying the Moves app on my iPhone 4. The app tracks all the walking, cycling and running you do during the day; working a bit like a mix between a pedometer and a GPS tracker, but all presented in one very slick bundle. Other apps work on the basis that you need to start and stop them manually when you perform any activity. Moves, on the other hand, sits quietly in the background recording all your different activity, using a combination of the accelerometer (to measure movement) and GPS (to measure distance) to work out what you’re doing, for how far, and for how long. 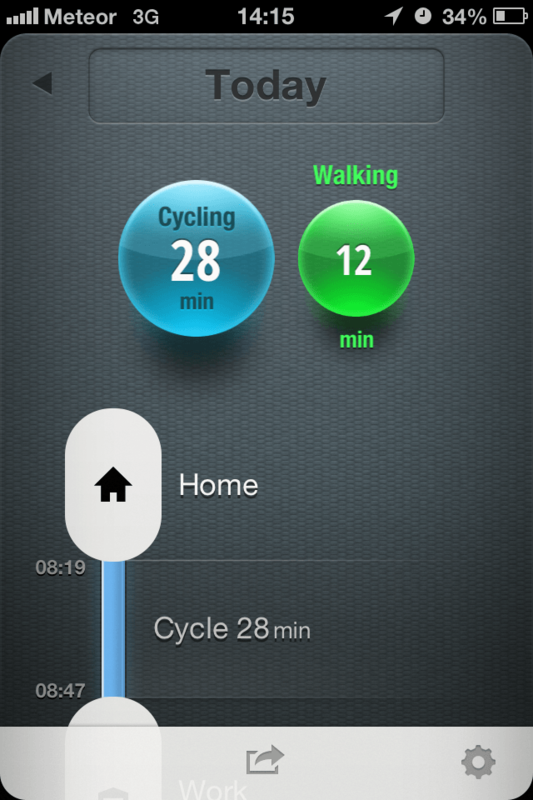 It then presents a daily summary back to you of your minutes, distance, and steps (walking only) for each activity. It also plots a timeline of your activity throughout the day, showing where you went, how you got there, and how long it took. It’s very clever of course, and I’m not entirely sure I quite understand how it all works, but I don’t care. It manages, somehow, to distinguish when I’m cycling (as opposed to in a car or bus) – and that allows me to track how much I ride each day. The only downside I can see to the app is related to the battery life of your phone. As the app runs constantly in the background, and taps into the GPS signal a lot when you’re moving, it uses a fair bit of juice. The developers say that they’ve tried to minimise the battery drain, and say you should still get a full day’s usage with an iPhone 4S or above. However, I’m noticing that iPhone 4 is running down somewhat faster than usual, such that under moderate usage I’m down to about 30% battery by mid afternoon – meaning that I need to recharge it at work to get a full day’s usage out of it. Having said all that, I’m still a fan of the app, and it’s especially good for people who build their activity into their daily routine to be able to track what they’ve done.